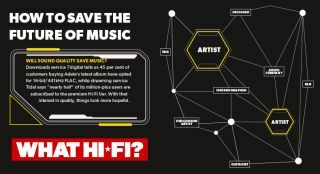 3 ways to save the streaming music industry | What Hi-Fi? How we consume music has changed in an almost unimaginable way in the 21st century. From the iPod to iTunes, smartphones to streaming, the recorded music business has evolved at a rapid rate - and remains in a state of flux. Even with all the positivity surrounding the vinyl revival, physical sales are in decline and digital downloads have been steadily falling since 2012. Streaming looks like the smart bet for how we will be finding, listening and paying for music in the immediate future but, simply put, none of the existing services are yet making enough money for long-term sustainability - despite the rapid rise in streaming revenues. Rdio is dead, cannibalised by Pandora. Qobuz recently went into receivership, before finding new funding. Even Spotify, the most ubiquitous of the lot, is registering heavy losses. But with Apple, long the biggest online retailer of digital music, now backing streaming too with Apple Music - the eggs are increasingly in the streaming basket. The massive record labels still hold the copyrights and so are better placed to weather the financial storm, yet they too are feeling the pinch. But it’s worse still for musicians looking to streaming services to provide a steady trickle of income. If that stream dries up, the future looks bleak for recorded music, and all but the biggest artists. So how can the music industry encourage more people to stream music and, crucially, pay for it? Why personalisation? Because it is no longer enough to offer a massive library of music. There must be more incentive for people to sign up and hand over money. Which is why Apple Music, Spotify and even the BBC with its new Music app, are looking to go big on curated content. When MP3 players and iPods came along, the idea of carrying all your music in your pocket was appealing. Now we have all the world’s music just a tap away, and it is overwhelming. So there has to be a degree of curation, selection and recommendation. That said, it is not acceptable just to trawl through data. Spotify knows this, and combines man and machine to deliver its well-received Discover Weekly playlists, which are based on user's previous listening habits and the listening habits of everyone else using the service, some clever human input and a sprinkle of tech magic. ‘Data-led hunches’ is the term offered by video streaming giant Netflix, and things are going pretty well for them. PewDiePie: showing the way ahead for the music industry? Curation adds value, but it is still passive. Streaming services need to be more interactive if they are to draw people in. Look at YouTube. It is ruled by internet celebrities with viewing figures that dwarf the biggest music stars. Take PewDiePie, a 25-year-old Swede who posts footage of himself playing videogames and swearing. His channel has nearly 41 million subscribers. Adele? Just under nine million. It’s not because an angry Nordic geek inherently has more appeal than a pop star. It’s because he engages. He might take suggestions. He might post comments, interacting with fans and offering a degree of authenticity. We’re not saying Adele needs to start replying to every comment that comes her way, but spontaneity generates buzz and these days that buzz gives you online clout. In-progress lyrics, inspirations, footage of an artist eating pizza – this is the sort of connection that engages. More personality than personalisation – and personality goes a long way. Kanye West is in the process of updating tracks on his recent The Life of Pablo album, updating the release on Tidal as he does so. It may sound slightly mad... but it's a clever way to keep people coming back to your music. And the new tracks - the Artist's Special Cut, if you like - are only available on Tidal. There remains the issue of power, held by the record labels in what some might argue is an outdated business model that does little to further the creative aspirations of artists. Grammy-winning artist Imogen Heap wants to break the mould. “Let’s say I decide I want to give my music away for free to students or people over 60,” she told Guardian Live. “Currently, I can’t do that, even though it is my music.” Her solution: turn the whole distribution system upside down to create ‘fair trade music’. “I no longer have a record label. I’m out of contract. Which means I’m free to experiment and find a way of working that works for the artists,” said Heap. She paints an image of a streamlined music industry that prioritises the relationship between artists and fans. In this world, artists receive payment directly to their websites. Publicly accessible contracts would show how much any collaborator is owed. Money is automatically and appropriately shared. Online shops and streaming services? They’d get their music from the artist’s website, same as everybody else. Apple Connect is trying something like this, allowing a personal feed of content straight from artist to fan - for paying subscribers, of course. "Artists. Fans. Zero interference," is how Apple puts it. The 'free trade music' offering outlined above is not as far fetched as it might sound. The infrastructure for such a system already exists in the form of a global network of interconnected computers. It is called the Blockchain - potentially the next step for the Internet as a whole. Could this system work for music? Possibly. The record labels won’t be pleased, but it could straighten the tangles of music ownership and arguably open the path to fair payment. And, ultimately, that could lead to a healthier industry. As well as curation, interaction and personalisation, we of course hope better sound quality, whether lossless or hi-res audio, will continue to play a key part in the package. And other features, from live performances to music videos to on-demand radio, will all thrown against the streaming wall to see what it sticks. Regardless, more compelling reasons need to be found for people to pay for streaming music. And to say there is a fair amount riding on it, is an understatement.